Okay, I have made it to payday and stayed above zero in my account, albeit $8.37 but that still counts. I will do better from here on out, I know I will because I resolve to. I did something that some may see as cheating that “not below zero” statement. I went out for dinner with a friend and wanted to treat. I knew that I didn’t have enough in the account to cover dinner and could just drip below zero just this once, as it is just a day. I want to get away from that habit; I need to train myself that zero means zero and to act as if there is no overdraft. I decided that I would put the drinks on the paid-off visa and then pay it off after I cash my cheque. This way my account never dipped below zero and if I pay it off right away there will be no (or negligible) interest. Silly and cheating I know but my other option was to just cancel and postpone dinner, and I didn’t want to do that. So I did go out last night and still stayed above zero in my account. Now, I know what you’re thinking as all this did was shift this expense to the paycheque I have in my hand. This is okay as I do have a bit of wiggle room on this paycheque. I should be able to do this and not go below zero before my next pay cheque, the one I will be saving for a room/parking place to rent. I have looked at the forecast and it looks early next week that it will drop down to -15C. I will be buying that electric heater and warmer clothes today so I am ready. When it gets that cold I will just plug in and use the electric heater to augment my furnace. I will be fine and my pipes should be too, yet we will see. Speaking of pipes, it is a good idea not to let your fresh water tank drop down to empty. Why is this? Well, because when you fill the tank again you will have an air-pocket between the pump and the tank of fresh water. It takes a bit of the pump running dry (not good) for it to clear the line and get water flowing again. How do you clear your line? Simple, turn the pump on and let it run for a few seconds, then turn a tap on and wait, this should work. This may take a few seconds to a minute but water will flow, sputtering at first. These pumps work on a pressure sensor on the faucet side of the pump. You turn a tap and the pressure in the line drops as water flows out of it. When the pump notices the pressure dropping on the “faucet side” of the pump (away from the tank) it runs the pump until pressure reaches a certain amount. If the pump runs dry for too long or overheats, it will shut down to prevent damage. If that happens just turn the pump off and wait a bit and try again. Either that or talk to an RV dealer and see what they suggest. How to I know this? Because when I plugged in on Wednesday night my water tank was empty. I had actually run it dry that Wednesday morning and almost waited till last night (my usual night) to plug in and fill it up again. Once again, it is always a good idea that whenever you get an opportunity top up your fresh water tanks, just in case. I didn’t blog yesterday because I took too long writing and didn’t have time, today I made time to blog. It is a good thing that I took yesterday’s sunrise picture because today it is all clouded over. 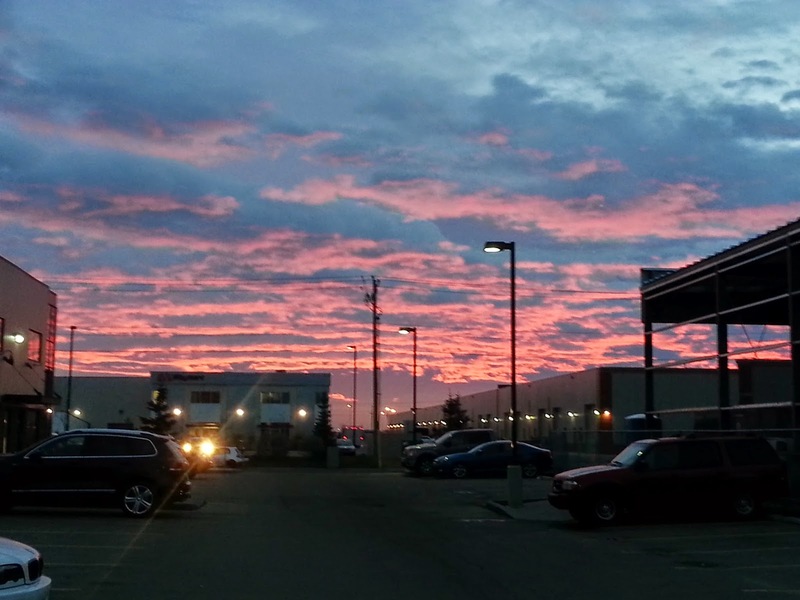 So here is the spectacular sunrise from yesterday as I sign off.